At the northern edge of Barker’s Island, set back from the Superior Bay shoreline less than two miles from the site of her 1896 launch, rests an unassuming little vessel with a big story to tell. The tale begins in 1888 with Captain Alexander McDougall, a retired seaman who settled in Duluth and entered the shipping business. A seasoned sailor of the Great Lakes, McDougall had an idea for a steel-hulled vessel that would ride low in the water and shed the waves of high seas off its back like a whale. Yet the first vessel was such a success that within the year John D. Rockefeller became an enthusiastic investor. Flush with funds, McDougall’s whaleback production moved full steam ahead and the Duluth facility soon became too cramped, but McDougall’s proposal to expand the yard was not favored by the Duluth business community because of the noise and dirt. In 1890 McDougall founded the American Steel Barge Company and began constructing his shipyard in West Superior’s Howard’s Pocket, near the site of the current Frasier Shipyards. A total of seven vessels were built in Duluth before the company relocated across the bay. McDougall’s innovative, steel-hulled freighters became widely known as “whalebacks.” They changed the future of shipbuilding and shipping on the Great Lakes, marking an important step in the progression from the wooden cargo ships of the time toward the thousand-foot ore carriers we see today. At the height of production in 1892, McDougall’s company employed 1,200 men working on ten whalebacks at a time. In 1893 McDougall launched the Christopher Columbus, which he presented at the Columbian Exposition in Chicago that year. In the winter of 1899–1900 the vessel was outfitted with a top deck and became the only whaleback ever used for passenger service. She ran between Milwaukee and Chicago on Lake Michigan from 1906 to at least 1933, and was scrapped in 1936. The 1896 launch of the Frank Rockefeller, now the S.S. Meteor, drew spectators numbering in the tens of thousands. Launches were high entertainment: business closed, school children were dismissed and throngs of people lined the streets. Excited viewers perched on buildings and crowded the shore along the slips where the vessels first hit water. The Rockefeller is one of about 40 whalebacks built by McDougall’s American Steel Barge Company. During her career on the great lakes, the Rockefeller had at least six owners. 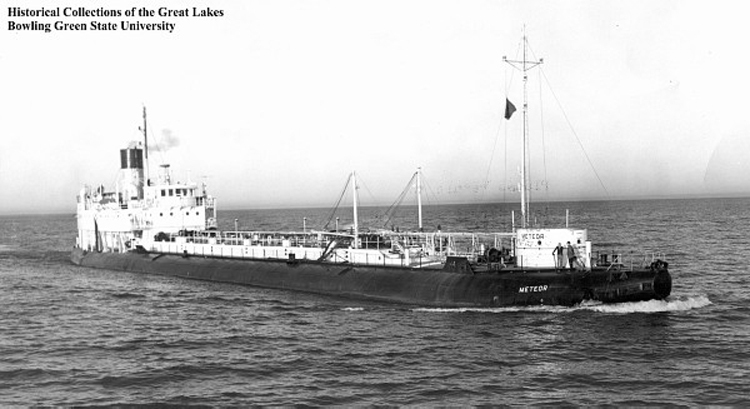 In 1927 new owner Central Dredging of Chicago renamed her South Park; when Cleveland Tankers, Inc., in Ohio bought her in 1943, they rechristened her Meteor. The Meteor found her way back to Superior after running aground near Marquette, Michigan, in 1969. Damage was minimal, but she required updates to pass Coast Guard inspection, and those changes were deemed too extensive—and expensive. The Meteor’s sailing days were over. With 73 years on the water, she was the longest-sailing whaleback, and today she survives as the only remaining example of these unique vessels. Cleveland Tankers offered to sell the disabled boat to the Superior, Wisconsin, in 1969, but there was little money in the city budget for such an expenditure. Then Mayor Charles Deneweth appointed a committee of local business and civic leaders to negotiate a deal. Harold Andresen, Lloyd Freer, Alex O’Kash and Norman Lubenville eventually convinced Cleveland Tankers to donate the vessel to the city for use as a maritime museum, but the deal hit a snag when the committee was informed there were no funds in Superior’s budget to tow the vessel. Unwilling to give up, the committee launched the “Bring Back the Whaleback” campaign and successfully raised the towing fee. Local legend says that the captain of the tug boat informed the committee that in the event of bad weather and high seas he would cut the Meteor loose and scuttle her, to which Harold Andreson reportedly replied, “Try, and I’ll shimmy the tow rope and ride that whaleback into the port myself.” The weather held, and in 1972, the City Superior became the Meteor’s owner. Safely land-berthed at her current site, less than a mile from where she was launched, the Meteor once again draws thousands of visitors operating as a whaleback museum maintained by Superior Public Museums.